CryptoSlots.com is adding a new five-hand version of Double Bonus Poker today. 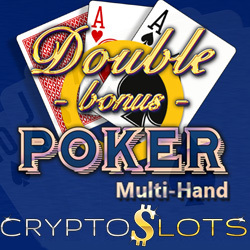 The crypto-only casino is giving players extra play time on the new Double Bonus Poker Multi-Hand by adding 35% to their deposits. Halloween cash top ups of up to $150 are also available until November 4th. At Cryptoslots, deposits are made in cryptocurrencies (Bitcoins, Bitcoin Cash or Litecoins) and are automatically converted to US dollars for game play. Deposits and withdrawals are easy and secure, with low transaction fees. Double Bonus Poker Multi-Hand is a variation of the popular Jacks or Better video poker game. In this version, players can play up to five hands at a time, each with its own regular 52 card deck. It has a wide betting range to suit all kinds of players. After any win greater than their bet, players can hit the Double button to take a shot at doubling their payout. May be claimed 3X per day. Wagering requirement 35X. Valid for Double Bonus Poker Multi-Hand only. Cryptoslots now has 16 provably fair slots (five with high limit versions), 7 video poker games and 1 million-dollar jackpot game.